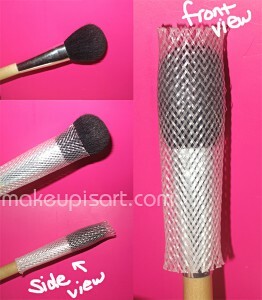 The Brush Guard- Pamper, pack, and preserve your brushes with love. Those who take that extra step to preserve their makeup brush hair, or those like me who have a slightly unhealthy obsession with their brush health overall, will appreciate this product from “The Brush Guard”. I first ran across this product at The Artist Summit by The Powder Group in New York. I know of a number of artists and brush consumers alike who have run into instances where a favorite brush has gone flat or just become wonky and warped from being placed in the wrong spot. This product offers a simple solution to keep them intact. Some of my own brushes have fallen victim to fraying bristles when I’ve rushed to pack my stuff up after a job and left it unprotected. I’ve even had to sacrifice my XL “aDesign” powder brush to the abyss that is the inside pocket of my makeup kit due to lack of room in my brush roll. I pray it is still intact every time I go into the abyss to reach for it! So, between a combination of a forum post asking about this product and the fact that my 3 year old has been running around with it on her finger all day, I figure it’s time take a closer look at The Brush Guard to see what it can do for me and my brush set. 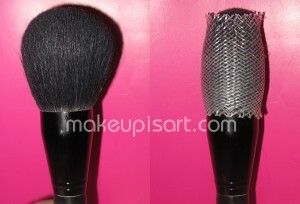 The brush was now slick and compact and free from frayed frazzled doom. I was impressed, but the real test would be my poor neglected adesign powder brush. I took it out from the abyss, had a little talk with it about how I was selfish and put my other smaller brushes before it’s needs, then we started over with a clean slate while I gave it it’s new Brush Guard coat. She (the brush) is now sitting comfy cozy with the rest of her friends in the brush roll and will be used a lot more in the future. I’ll be placing my order for the assortment pack to get her in the proper large size soon enough. For now I will let her enjoy her new svelte self in the medium guard so she can regain her confidence in knowing she won’t be going into the abyss pocket anymore, but I doubt she’ll be letting her Guard down anytime soon.